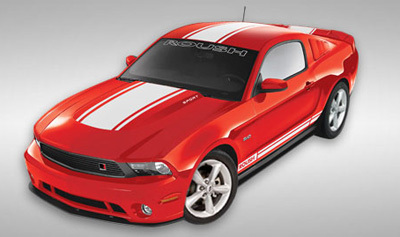 The 2011 Roush Sport is the newest addition to the Roush Performance stable for the 2011 Mustang. Looking very much like it's fire breathing cousin, the 5XR, the new appearance package freshens up the exterior, adds some more cooling and of course, broadcasts to the world that you have something special. One thing you'll notice about these Roush styling body kits, is the extra engineering that goes into them, that makes them look part of the OEM package. A close look at the black pieces reveals a grain, something you'd expect from a factory car, but not usually seen in the usual Mustang body kit. And of course, in the end, you have a true serialized Roush Mustang. Exterior StylingThe Roush Sport package includes, the signature, Roush' upper billet grille and badge, lower front fascia (bumper cover) with fog lamps and lower chin spoiler. You'll also find the black lower side splitters and rear valance, with a decklid spoiler and emblem. Considering who's making them and the quality of the parts, the cost of the 2011 Sport package is actually pretty reasonable at $4,600.